Honda Service and Repair – Formula H Motorworks, Inc. 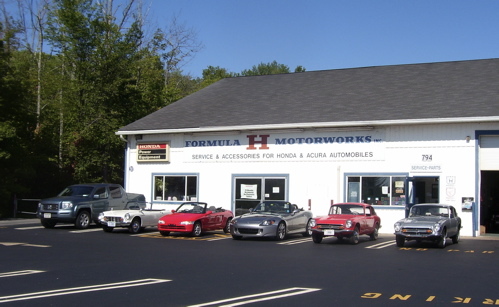 Formula H offers a wide array of service, maintenance and repairs for your Honda or Acura. We offer complete diagnosis and repairs from a check engine light code to a transmission replacement. Offering complete service including routine maintenance and repairs, we use factory recommended procedures and genuine Honda and Acura parts. Since 1996 Formula H has also been an authorized sales and service center for Honda Power Equipment featuring Honda’s renowned product line of generators, lawn mowers, snowblowers, string trimmers, garden tillers and water pumps. Formula H’s exceptional staff emphasize two essential elements in its operation: performing precision work with exceptional value on the vehicles and providing courteous and informative communication to their owners. It’s been a method that continues to satisfy loyal customers and to earn new converts each week. When you think Honda or Acura, think Formula H! If you are already among our loyal following we genuinely appreciate your business! If you have not been to us yet, please call and discover why many people who will not take their Honda or Acura anywhere else.